There is a distinction that's being drawn here. 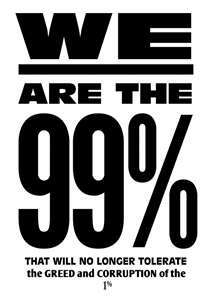 They are calling themselves the 99% in contrast to 1% who control the wealth in this country. It is really drawing class lines. That could be some cause for alarm. My initial thought when I began learning about the 99% slogans was that it serves, in a way, to fulfill Fox News' prophecies of class warfare. There is a clear line being drawn. However, the problem is not that lines are being drawn, but they are being drawn without clear explanation and without appropriate nuance. When equality and difference are paired dichotomously, they structure an impossible choice. If one opts for equality, one is forced to accept the notion that difference is antithetical to it. If one opts for difference, one admits that equality is unattainable. . . . It makes no sense for the feminist movement to let its arguments be forced into preexisting categories, its political disputes be characterized by a dichotomy we did not invent. How then do we recognize and use notions of sexual difference and yet make arguments for equality? They only response is a double one: the unmasking of the power relationship constructed by posing equality as the antithesis of difference, and the refusal of its consequent dichotomous construction of political choices. The root meaning of equality is negative; egalitarianism in its origins is an abolitionist politics. It aims at eliminating not all differences, but a particular set of differences, and a different set in different times and places. How then do we recognize and use notions of economic difference and yet make arguments for equality? There are real differences in the world and by drawing the line at 99/1 the Occupy Wall Street movement has chosen to highlight some of those differences. On one hand, it was naive of them to not expect even more heated accusations of "class warfare" from those that have been pushing those claims for a while now (to be clear, I do not think that is what Ali Velshi was doing at all); on the other hand, they are drawing the distinction without appropriate nuance. There are moments when it makes sense for mothers to demand consideration for their social role, and contexts within which motherhood is irrelevant to women's behavior; but to maintain that womanhood is motherhood is to obscure the differences that make choice possible. Her overarching point is that we must allow ourselves to see, and especially to articulate well, the "multiple play of differences," highlighting injustices and inequalities when present, but also realizing that the mere presence of difference does not equal inequality. So, have some people in politics and the media been engaging in "class warfare" of late? I think so. Is the Occupy Wall Street movement engaging in "class warfare"? Of that I am less sure, but if they continue to lack appropriate nuance to their 99/1 distinction then it will certainly come across that way. There is no doubt that the "middle class" of America has taken the hardest hit over the past few decades and it seems clear from the analyses I have read of the economy in recent years that our economic system inherently favors the wealthy of the not-so-wealthy. There are systemic changes that must be made if true equality is to be found, but the "systemic evils," if we can spare a little hyperbole, are not found in the mere presence of difference (i.e. some make 25,000 a year and some make 25,000,000 a year). The sooner the Occupy Wall Street movement, and those covering the movement, realize that the equality/difference dichotomy is fundamentally flawed and that it produces impossible choices, the sooner the movement will get my full support and the sooner our country will move toward real change that addresses real problems and doesn't conflate difference with inequality and vilify one group of people simply on the grounds of difference.